Ufton Court Educational Trust is an innovative charity aiming to inspire and challenge children and young people. They provide children with day and residential experiences focusing on living history, the environment and personal development, in a remarkable Tudor Manor House, with a Tudor Farm, in the grounds of Ufton Court, a few miles south west of Reading. Their latest project is Ufton Adventure, aimed at economically and socially disadvantaged children. The Trust intends to build several timber cabins in peaceful woodland, to provide the opportunity for children from the most deprived local areas to enjoy repeated visits. They'll experience a range of activities, such as survival skills, archery, canoeing, leadership and wall climbing, as well as time for mentoring and quiet solitude. A third of the children will come from South Reading. We arranged for 40 children and their families to spend a fun-packed day at Ufton Court in February 2013. 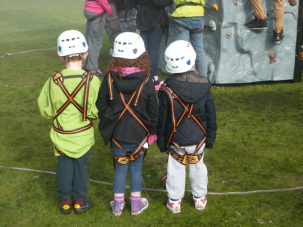 The children were able to sample all kinds of exciting activities. As you can see, the climbing wall was quite a hit!